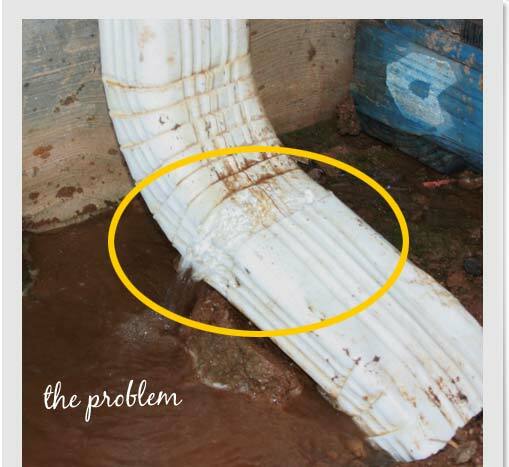 Clogged underground gutter pipes or gutter drains? Get the Drain Water Rooter, underground drain cleaner! I'd panic every time it rained. run clean, I can relax and enjoy rainy days. Click here for direct, discount pricing. As many homeowners know, clogged gutters and downspouts can be an on-going problem. And it's even worse for those of us who have gutter drains that are buried underground! For years I'd panic every time we had a hard rain. I'd race home, hoping to get there in time to 1) make sure that my sandbags were in place and 2) start sopping up flood water as a result of our clogged underground drains. Plumbers tried cleaning out our underground drainage pipes - yet the problem continued. I'm no handyman (and I certainly have no plumbing skills) but I attached the Drain Water Rooter to our garden hose, turned on the faucet and started feeding hose up the exit end of the drainage pipe. Every once in a while I'd hit a snag. I would twist and turn my end of the hose and, if the clog didn't free up immediately, I'd secure the hose into place and let it sit for a few minutes while it ate away at the clog. Sure enough, leaves and muck would start flushing out. Within half an hour, our 80-foot underground gutter drain was flowing clean as new. We've had plenty of rains since and, I'm happy to report there's been no more flooding! Thank heavens for my friend's Drain Water Rooter. Order the original Drain Water Rooter and start enjoying clog-free gutter drains! Plus a flat $5.50 for USPS 1st Class shipping. Assembled in USA. Satisfaction Guaranteed! back for a full refund! Satisfaction is guaranteed! This past wkd was forecasted to be one of our last warmer wkds of the year, so I dragged my hoses out and gave the Water Rooter unit a try. I wish I had taken my phone outside. It would've been an interesting video. I started with the most-clogged drain. The hose went in about 3' before hitting a clog. I turned the water on high, and what came out look like motor oil! About every 30 seconds, I could feed the hose several more feet until it was clear enough that the hose actually made its way out of the drain and up into the downspout. I had to discipline myself to shut the water off before the flow looked as clean as drinking water. It was getting close, but I was concerned about flooding the yard. The next drains weren't nearly as bad - only a few minutes of flushing to get peace of mind that they won't be clogged over the winter. What kind of hose do you recommend? 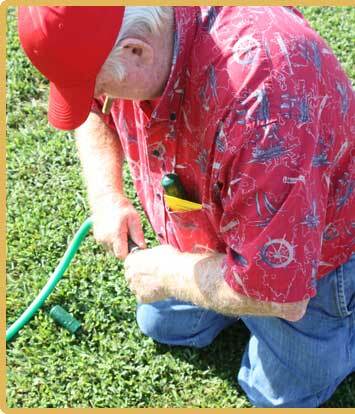 5/8" is the most common garden hose size that you'll find at any hardware store or garden center. And while the inside width of the rubber part is a little bit larger on a more commercial-type 3/4" hose, both the 5/8" and 3/4" hoses share the same size male and female connectors. So the Water Rooter will attach just fine to either size of hose. I have 35' of 4" of black pipe running under the sidewalk out to the street. Is that gonna work? 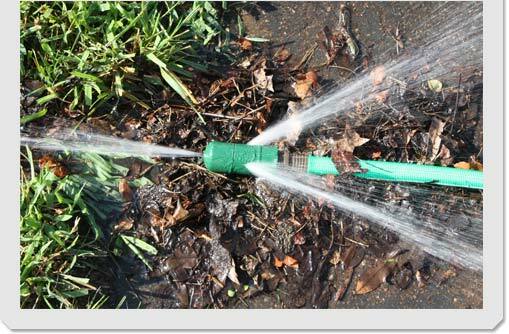 We most commonly use the Water Rooter to flush out 3" and 4" underground pipe. And I recently used it on a run of about 70', so your 35' pipe length is certainly do-able. And, just a reminder -- if possible, you'll want to feed your hose from the street (exit end of the underground drain pipe) rather than from the gutter end. That way, you're continually flushing out the debris as the Water Rooter eats away at the clog. The nut has been cracked!! The secret is out! When I started cleaning sewers and drains back in 1969 -- the most challenging jobs seemed to be gutter drains (the pipe that runs away from your gutter downspout that gets clogged with rotten leaves and debris). 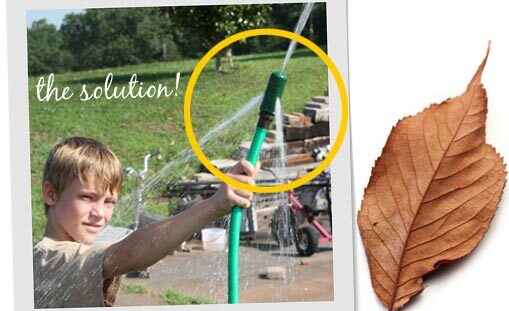 After trying many methods, I decided that I needed to come up with an invention that would wash the leaves and debris out of a 3" or 4" line. And that I did!! When all the other plumbers and drain cleaners failed and wanted to dig the lines out, I would come to the peoples rescue with my secret invention and put it to work saving them money. I am now retired and telling the secret. It is called Drain Water Rooter as our trademark. My Water Rooter can you save hundreds of dollars (and prevent your basement walls from cracking). It will make your local plumbers and drain cleaners sad, so buy a gutter drain cleaning Water Rooter today! 2010-2018© Drain Water Rooter™ - the safe, affordable and guaranteed effective way to clean clogged, underground downspouts!